NEW ITEM 2019 WOMEN COLLECTION ! 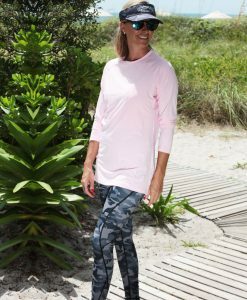 Our Bluefin USA leggings are designed to provide comfort and performance: whether you are fishing, boating, paddle boarding or practicing yoga on the beach you will appreciate the stretch and recovery of our leggings in every moment of the day. These leggings provide a flattering look while combining SPF50 ultraviolet sun protection to keep your skin safe from the damaging rays of the sun. They also feature moisture wicking treatment that allows for extreme breathability as well. Advance cooling system , fast drying properties and US pattern designs distinguish the Bluefin Usa leggings from the rest out there.